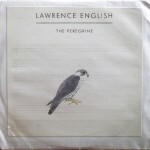 The Peregrine (EXPERIMEDIA EXPLP020) by Lawrence English came out in 2011 as a vinyl LP, offering two sides of virtually non-stop ambient drone electronics of an overpowering richness. I can see some sense in the press release’s notes about “saturation”; this is the kind of very full sound that can drench a listener, and to step into this environment is to emerge dripping head to foot with strange digital washes and thick syrupy gloop in your gumboots. The second side is slightly more introverted and bleak than the first, but it’s all the kind of whirlpool-quicksandy anti-matter than English not only has made into one of his readily-identifiable signature sounds, but is also music that’s steeped in melancholy and wistful emotions. He based the work on a book called The Peregrine by J.A. Baker, finding musical inspiration not so much in the flights or predatory activities of this hawk-like avian monster, but in the book’s descriptive passages which apparently expend much prose on the environment, the land, and movement within it. This is also expressed by visual analogue on the cover, in Eugene Carchesio’s painting which depicts said bird in front of a row of empty musical staves. Also on vinyl LP is Mark Fell‘s Periodic Orbit Of Dynamic System Related to a Knot (EDITIONS MEGO 133) which came out in late November 2011. It’s a very percussive-heavy set of electronica which proceeds at a fairly relentless pace with rhythms and cross-rhythms that would be impossible for anything but programmed machines to execute, and despite Fell’s consistently minimalistic approach to production it’s a fairly exhausting listen. I think this is due to two main factors: (1) remorselessness, as the beats start to feel more like the blows of a surgical hammer working its way through the shell of your cranium to attack soft brain tissue within; and (2) complexity, because Fell consistently refuses anything so obvious as four-beats-to-a-bar, preferring to programme his devices to deliver odd syncopations and trip-wire booby-traps that can entangle the feet of the unwary. Anyone attempting to dance to this music will indeed find themselves “related to a knot” in a way they hadn’t quite anticipated. His electronic melody lines (for want of a better term) are vaguely familiar enough to strike a chord with listeners conversant with more user-friendly dancefloor music, but the avant-garde manner in which these elements are set forth is unlikely to be mistaken for Saturday night entertainment. The album was compiled from a range of things lurking in Fell’s digital grab-bag, including out-takes, live work, and unreleased records, and is seamlessly presented here as two side-long suites executed with merciless precision and timing. Day Lineal scored a hit with former TSP writer Aaron Robertson in 2007 with their Sound Like You Mean It album. What Will You Become? (NO LABEL) arrived here 24 November 2011, and shows they’re not exactly a prolific entity – this is only their fourth release since 2001. What we have is ten charming and rather unpredictable instrumental pieces, which proceed down an imaginary garden path with tripping gentle beats and regular rhythms, even when their melodies are not particularly memorable. Day Lineal’s chief appeal resides in their distinctive sound, which involves a process of recording and re-recording, using dictaphones to add that vaguely distorted impression which studio technicians strive so hard to create with filters and other effects. Most of what we hear is the sound of the musicians playing along to their own lo-fi pre-records, sometimes layering in subliminal field recordings for added ambience, and the album is a warm and appealing set of percussion-heavy music with an intangible nostalgic dimension, like fragments of Gamelan music captured from times past and replayed in a sun-filled nursery. Another one Mego put out last winter was MP3 Deviations #6+7 by Yasunao Tone (EDITIONS MEGO 125). I found the whole thing repellent and unlistenable, but don’t let that put you off as it’s intended as a serious experiment in electronic music and has a deep commitment to the methodical scrambling of digital audio information which, I suggest, has been one of this label’s consistent aesthetic benchmarks since its very earliest times. 1 Working with collaborators at the New Aesthetics In Computer Music and the Music Research Centre at York University, Yasunao Tone created these two long pieces in New York in 2011 as part of his quest to develop a new form of audio software through “disruption of the MP3”. As part of his work, he succeeded in corrupting a source sound file to the extent that he could transform mistakes that would normally be regarded as processing errors into a new form of automated sound generation. He also hacked into an application and did various evil things which play hob with playback speeds, pitch, and stereo channels. Net result is that Mr Tone is persuaded he has invented a novel form of digital playback software, harnessing the unpredictable results which come from feeding corrupt data into a mangled application; presumably, although this is not explicitly stated on the release, the unpredictable-ness is somehow made constant and repeatable. He has since used it for live performances in public places, so it must have reached a steady state by now. I’m sure it succeeds on technical grounds, and probably what we hear is as close as we’ll ever get to “hearing” the actual processes by which a piece of software acts on a stream of data. As music, it’s well-nigh impossible for human ears to endure: an absurd and chaotic spew of non-musical wheezes, whines, high-pitched squeals and inhuman digital grunts. Symeta (RASTER NOTON R-N130) by Byetone fits right into the way today’s post is shaping up, with its ultra-precise electronic beats and dub-like pulsations. Unlike most of what we’d heard today however, Byetone still believes in old-fashioned ideas like musical development, and although incredibly minimal and mechanical, his avant-techno pieces tend to keep to the same beat rather than opting for the massively-syncopated approach of Mark Fell, and pleasing melodic progressions in tone and pitch are not ruled out of scope either. I gather that some listeners find Byetone’s work pleasing enough, but grumble that he strays a digit too far from the Raster Noton aesthetic of pure abstract glitch, and that his music isn’t much more than an update on conventional or tried-and-tested forms of electro-beat music that are already regarded as old hat. However, that’s an area that’s beyond my ken, and today I’m finding these monotonous hypno-throbbers a very pleasing spin. Although it’s mostly the sort of impossibly-perfect superdisco music that we might expect from this label, there are two tracks called ‘Helix’ and ‘Black Peace’ that are much dirtier and distorted, almost “heavy metal” with their repeated loops of grungeiness, and it’s here at least we can see where the Suicide comparisons are coming from. Olaf Bender is Byetone and has been making music since 1999; Symeta derives from his live work of the last two years.